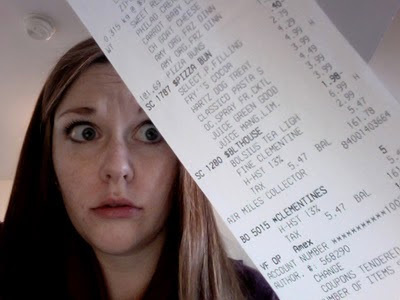 My favourite part of Extreme Couponing was when Joanie talked about her stockpile. As she described her organizational methods and how she rotates goods according to expiry date, I was brought to a nearly euphoric state. "She's a woman after my own heart," I told Jay in complete reverence. I want a stockpile! I too, want to rotate my goods according to expiry date! I want to never run out of toothpaste again! Having a stockpile would fit so neatly into my "clean as you go" life philosophy. Dishes should be cleaned immediately after eating, words should never be left unsaid and goods should be bought before you even need them. When we first viewed our place with the real estate agent, we were disappointed to learn that there wasn't a parking space or a storage unit. So when we first saw the upstairs, it looked promising. There was a very small clothes closet and what appeared to be two additional closets. Er, not so much. Behind door #1: washer and dryer. And behind door #2: a furnace and some fire hazards. And what about door #3, the only other closet, downstairs? A hot water tank and more fire hazards. So what do you do when you don't have a single closet in your house? The first step is to purge everything that isn't a necessity. In the year and a half since we moved in, we've conducted at least four major purges and we're still not done. Jay and I essentially only own what we need to live. We also utilize every bit of space possible. As seen in the first picture, we have a blanket box stuffed to capacity at the foot of our bed. Under the bed are bins for linens. Our furnace closet houses tools and suitcases, while the water heater closet holds dog food, grocery bags and brooms. So where would the stockpile go? The kitchen seems to be the only option. Lots of space, right? So what am I going to do when prices drop low enough to buy a year's supply of Kraft Dinner? I'm never going to have a stockpile like Joanie. However, I do have one thing working to my advantage. Unlike Joanie, I don't have kids. (Or at least none that I know about.) So a year's supply of cereal for me would for six boxes, not 25. My own coupon philosophy will have to be a bit more realistic. I will only buy truly what I need and I'll focus on expensive items that take up less space, like toothbrushes and razors. -By shopping at Metro, I collected Airmiles on my purchase and paid with Amex to collect Aeroplan points as well. -And the pet store? They don't accept Amex, but they do award Airmiles. An expensive grocery trip, but I already have enough Aeroplan points to fly home to Alberta this summer. Let's see if I can make it to Malta for free. Just wanted to know you were my favourite read in 2010 and you're my favourite read in 2011! Not that it means much I just wanted you to know. Using Airmiles is a really good idea, eh? We have a card, but it seems like you need one of their credit cards to get the most out of the program. ..and I feel your pain on the storage thing! But you seem very organized. I have a points card obsession! Always trying to get the best deal. :) Can't wait to hear about your coupon year!